While visiting my dearest friend and college room-mate Haeley Burch in Houston Texas a few weeks ago, our conversation turned to Fawn Over Baby and my future plans regarding content. As a suggestion, Haeley began telling me an amazing story about a former co-worker of hers, Jennifer Welker. 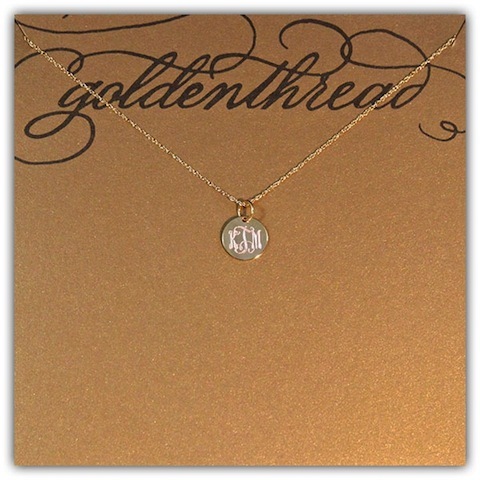 A former registered nurse in the neonatal ICU in Houston Texas, Jennifer is now the designer and owner of the exquisite custom jewelry collection, Golden Thread. Initially, Jennifer began creating jewelry as a therapeutic outlet after spending her days/nights caring for ill babies at Children's Memorial Hermann. Just for fun, she would make these custom necklaces for friends and soon began receiving requests to sell as gifts, eventually offering them for purchase through her friend's local boutique. 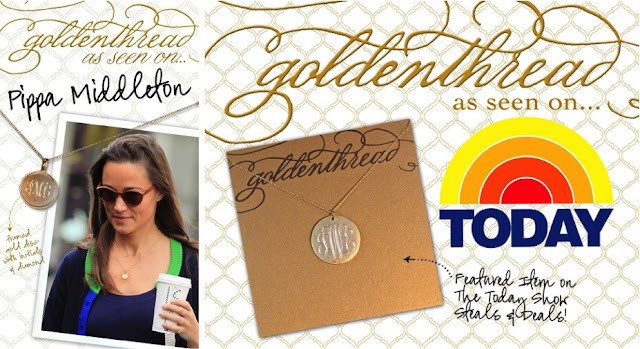 Her jewelry became a big hit in the local market and after her clever idea of sending a sample to two of her favorite style icons, her jewelry soon caught the eye of the worldwide market. 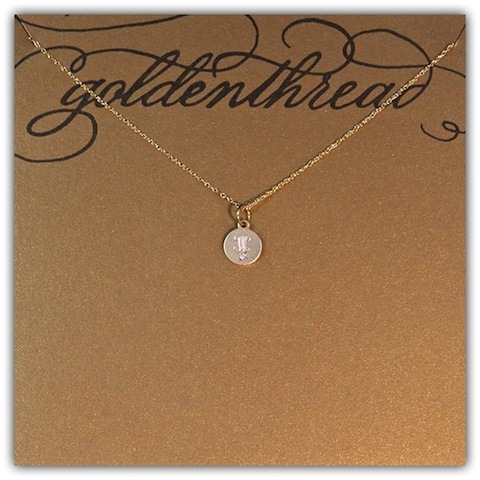 While knowing that the Middleton sisters are fans of dainty gold jewelry, Jennifer took a leap of faith and decided to send one of her engraved necklaces to each Catherine, Duchess of Cambridge and Pippa Middleton. Although Buckingham Palace sent Kate's necklace back - as they are not allowed to accept gifts from people they do not know, Pippa was seen wearing her necklace proudly - retailing for $680.00! Soon after, the whole world took notice. 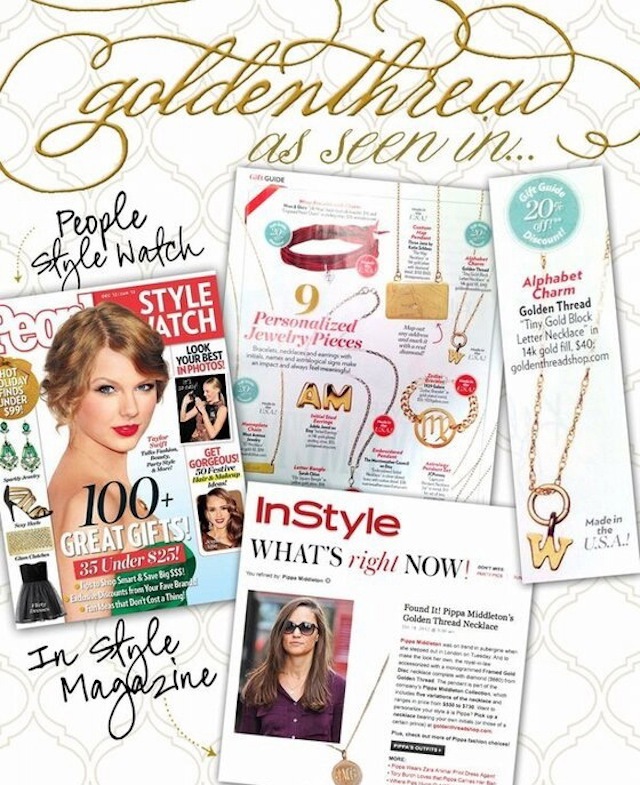 Instyle Magazine included Pippa wearing her engraved necklace in their "What's Now" section as well as People's Style Watch magazine requested Jennifer to send over a discounted necklace for their "holiday gift guide", which featured a single gold block letter retailing for $40.00. 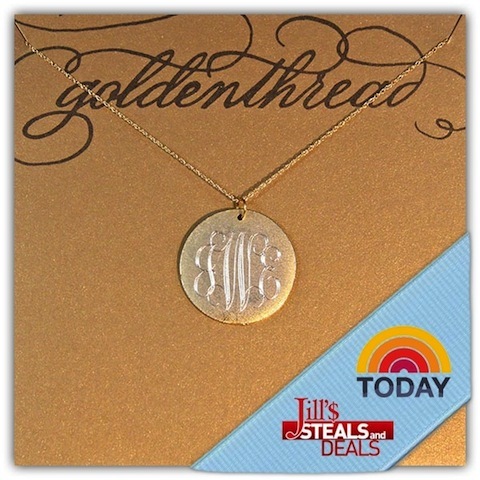 Then the Today Show called and requested a super discounted piece for their "steals and deals" segment - featuring a large gold disc necklace retailing for $47.00. 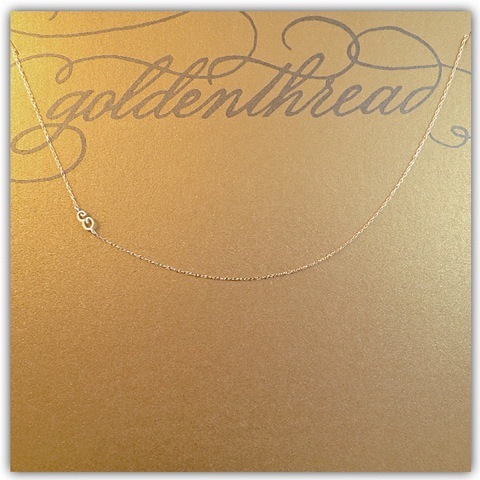 The recognition does not stop there, to see more Golden Thread Ravs, visit Golden Thread's "As Seen In" section for more highlights. To say that her story is an inspirational one is an understatement. So many of us have a talent or idea that is just waiting to be discovered, we just have to believe in ourselves enough to share our gift with the world. 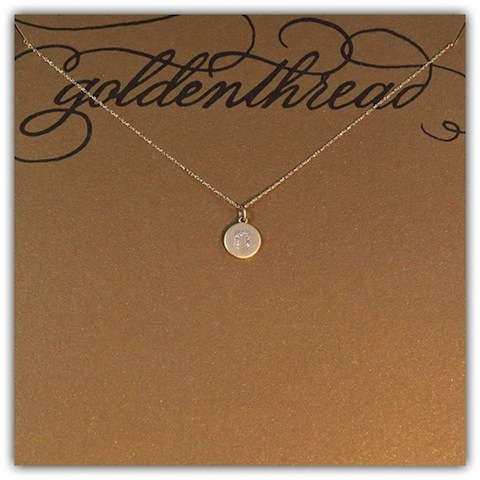 If you are looking for that perfect gift for a birthday, wedding, graduation or for the sweetest of occasions, a "push present" (for a mother following delivery), Golden Thread's custom designs range from $40-$1000. 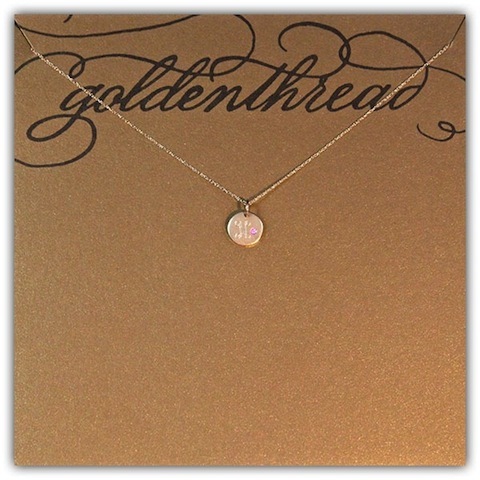 Visit their "Create Your Own" category, where you are able to choose your preferred necklace length, charm design, engrave design as well as add diamonds or other precious stones for that added touch of sparkle. 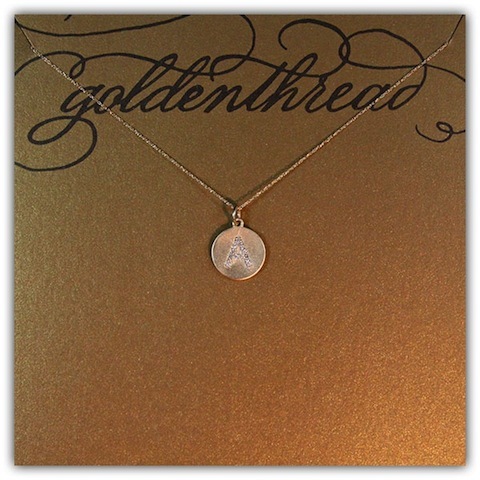 Be sure to also check out her beautiful new Rose Gold Collection that will blow you away! Thank you Melissa!! We are loving this blog post!! Beautiful necklaces! 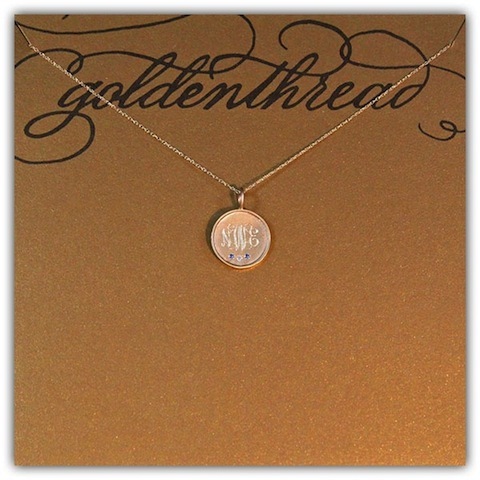 I think I may have to check out the site, I'm dying for a monogram necklace! Thanks for stopping by my blog and following : ) Following back on BlogLovin!